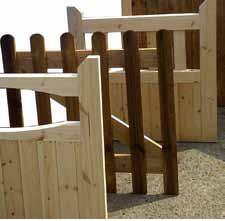 Our fully framed closeboard gates are framed, ledged and braced. Made with a 100mm X 50mm PAR Kiln dried timber, then dipped in preserve for good measure - these gates are our most popular. We stock standard sized gates as listed below - however if you have a specific size needed, we can make it for you. Non standard sizes are bespoke and require a deposit. TGV Gates are framed, ledged and braced just like closeboard, but instead are clad with tongue and groove timber. The gate depicted shows the header bar at the top. Standard gates come without header bars. We stock standard size gates as listed below - however if you have a specific size needed, we can make it for you. Non standard sizes are bespoke and require a deposit. P3, Roundtop picket, P1 An assortment of gates. From front to back - P3 Style / Roundtop picket eco / P1 Style. These are a stock item in 900mm X 900mm. They can also be made to measure. 5 Bar field gates are all 1.09m in height (to the top of the top rail). Available from stock at our Erith branch. Available pressure treated Green, these gates are ideal for your driveway, farm or school. The gate has morticed joints, and is bolted together in the middle sections to create a sturdier gate. 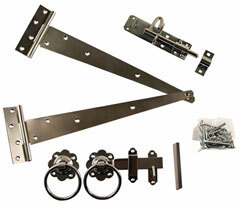 Gatemate sets come complete with screws and fitting instructions. Available finsished Black coated, or Galvanised. Economical fixtures are also available from stock, please contact us for up to date prices.